AR500 Armor® offers multiple carrier packages intended for use in a variety of scenarios from emergency to duty. 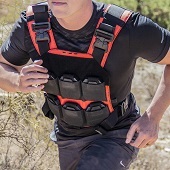 All AR500 Armor® Carriers are fully adjustable, and range from size Medium to XXL and are based on the Modular Lightweight Load-carrying Equipment (MOLLE) standard allowing for the maximum in operator configuration and customization. All AR500 Armor® body armor is 100% made in the USA and manufactured from NIJ Compliant or Certified Ballistic Plate designed specifically for Armor applications.